Well it’s been a really hectic few weeks and the ‘glitches’ project group has grown. 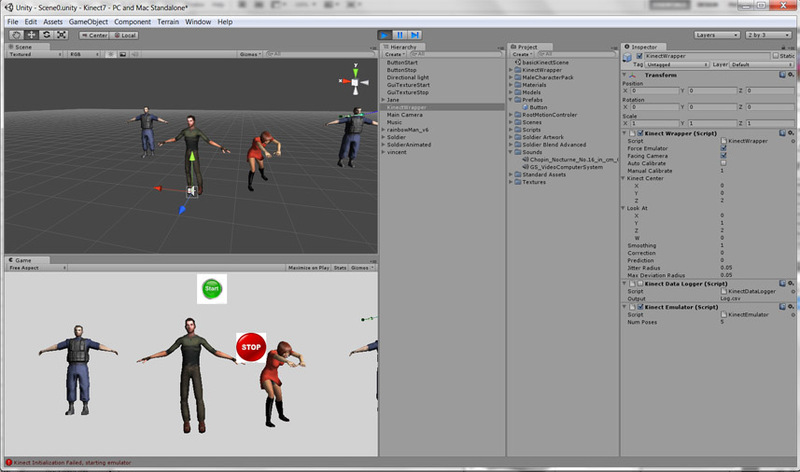 Software and ex-Nintendo games developer, Hemal Bodasing, is working away with the Kinect and Unity. Here’s a very in-progress screen shot of where we’re up to, with basic functions in place. Lots and lots of tweaking and interface design ahead. 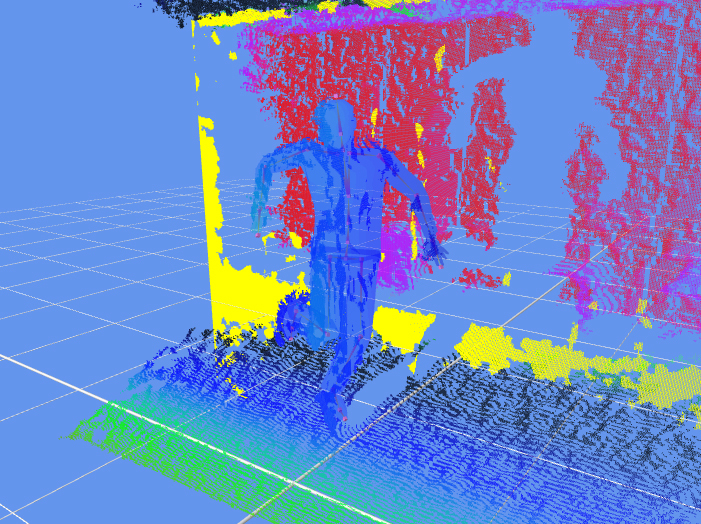 I’ve also had some great help on the motion capture side from Chris Davies of interface3. As a result, I’ve been trying out the ipisoft setup to capture Tony’s last version of ‘glitch choreography’ and subsequently have spent many an hour getting it to track correctly! There’s still work to be done but it’s a very nice setup to work with. 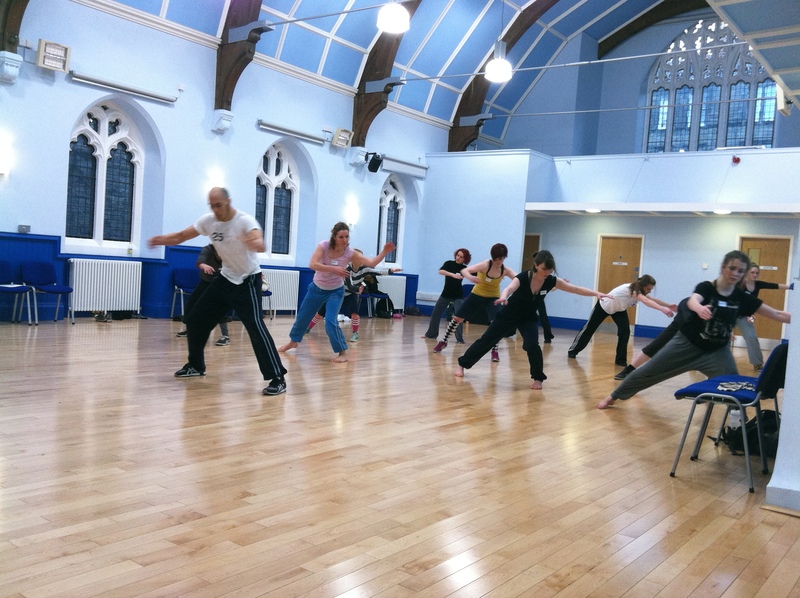 We had a ‘glitches’ workshop audition led by Tony, on Sunday 18th Dec, at the Calton Centre, Edinburgh, to find two female dancers to take part in the performance version of the project. The turnout was great and I was really impressed with all the participants. In the end we chose the very talented Hannah Seignior and Felicity Beveridge to perform with Tony. We’ll start to work together properly during a performance development week, beginning Jan 23rd. The composer/sound artist Martin Parker is another very welcome addition to the project group. Martin is a very experienced composer and performer (also Programme Director for the Msc in Sound Design, so it’s great to collaborate with someone across our newly formed eca, post University of Edinburgh merger), who has already brought many interesting ideas about how we can create and control sound, for and within the performance. Martin will also be joining us during the performance development week in Jan, to begin work on the performance soundtrack. Late in December I met with Nord Architecture, who Scotland & Medicine have commissioned to create the Human Race exhibition design. I’m very pleased about this and inspired by conversations so far – I feel in very capable hands! Over and out for 2011 – roll on 2012! In my ‘glitches’ research I’ve come across some really interesting projects that other artists and designers have been making on this theme. There’s a lovely project ‘Postcards from google earth’, by Clement Valla, featured in the Glitch Issue of IdN magazine. In this Valla exploits irregularities in google earth’s data interpretation of various bridges, which creates a fantastical, often white-knuckle ride version, of these architectural structures. “glitches…are unintentional. Glitches generate forms that no individual has thought of or set out to create. Rather, they result from the interaction of the material processes (glitches due to hardware), the code (glitches due to software), and the user or programmer. “ Clement Valla. 2011, Postcards from google earth. IdN: Glitch Issue, Volume 18 no3, p24. Another great ‘glitch’ project is JODI’s Max Payne Cheats only. JODI, playful and disruptive as ever, have focused on the not so functional areas of this highly sophisticated game, and revel in absurd moments where the user is inside the protaganists head (literally in there, behind his eyeballs – we’ve all been there in one game or another!) , locked in physical loops (as a leaping naked lady) and makes attempts to ascend an inescapable staircase (no matter what characters they inhabit).